Erwin J. “Ace” Adamcewicz was born on November 8, 1929 in Norwich, Connecticut, and attended Norwich Free Academy. 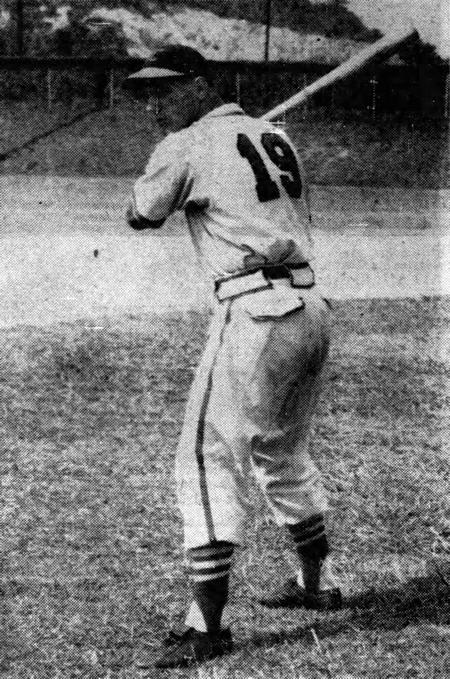 He signed, aged 17, with the St. Louis Cardinals in 1947 and appeared in 54 games with the Lenoir Red Sox of the Class D Blue Ridge League, batting .271.
night," announced the Kingsport News on September 3, 1949, "with Adamcewicz coming out on top, 1-0, to sweep the double-header." He allowed just three hits and struck out four. He was sold to the Allentown Redbirds of the International League during the off-season and reported to their spring training camp at Albany, Georgia, in 1950. The 20-year-old was assigned to the St. Joseph Cardinals of the Class C Western Association for the season and led the team with 13 homeruns (including a grand slam against Muskogee on May 21) and a .325 batting average, being named to the league all-star squad. That same year, another Western Association player named Mickey Mantle, hit 26 home runs and batted .383 as a shortstop with the Joplin Miners. Ace Adamcewicz's baseball career came to an end after the 1950 season as military service beckoned. Assigned to the 179th Infantry Regiment, 45th Infantry Division, Corporal Adamcewicz served in Korea, where he was seriously wounded in action on May 14, 1952. He was returned to the United States and was at the military hospital at Fort Devens, Massachusetts, when he succumbed to his wounds six months later on November 21, 1952.